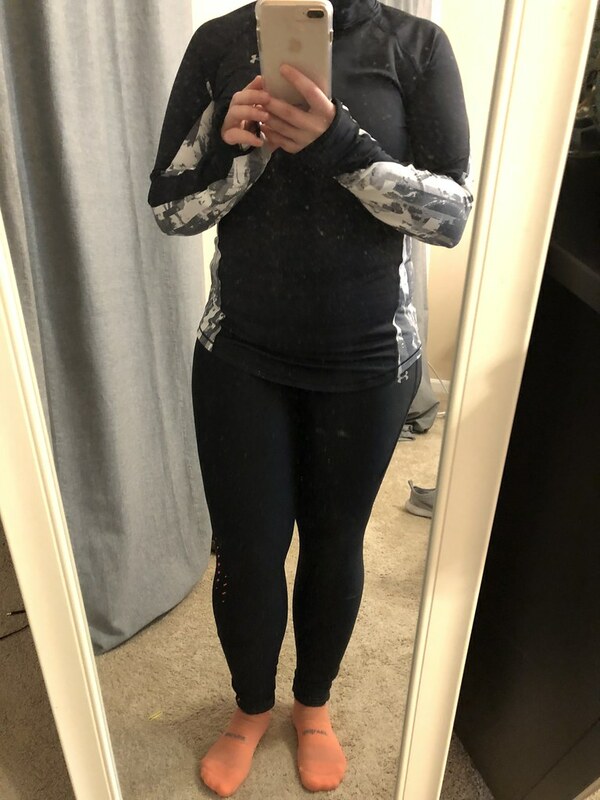 A few weeks ago, a girl in my MRTT group posted a picture of her ArmourBox on Facebook. Immediately, I wanted to try it out. 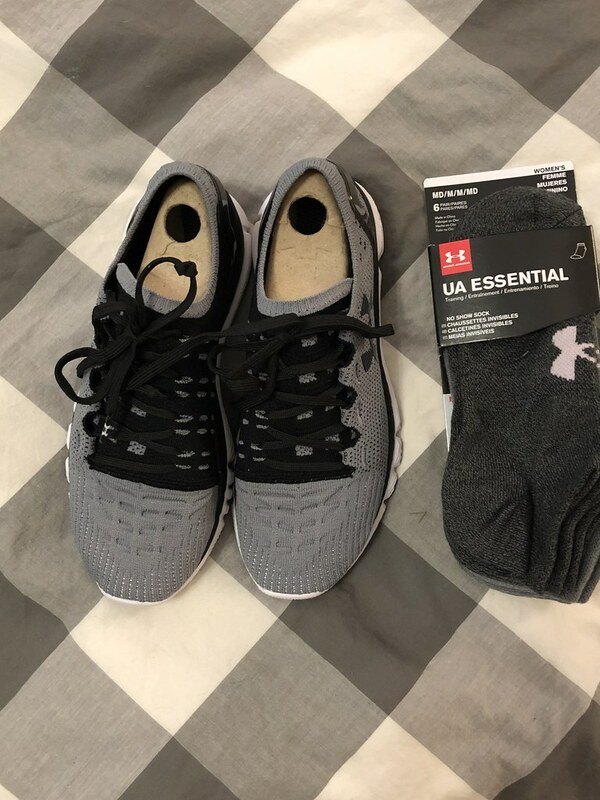 I’ve had mixed experiences with subscription boxes – I’m looking at you StitchFix, but given my love of Athleisure wear and Under Armour running gear… I figured it’d be worth a try. There’s no risk, no styling fee, you pay for what you keep and if you keep the whole box (I had six items) you get 20% off everything. You can also exchange items for different sizes AND colors. 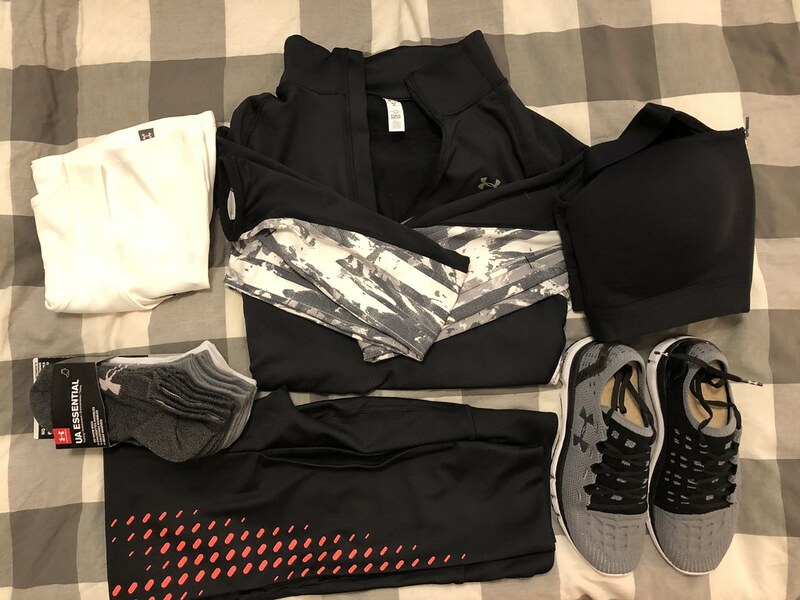 Not to compare to Stitch Fix really, but every time I’ve tried to exchange SF pieces, they’re always sold out – I was delighted that I had options with Under Armour and the prices? Weren’t really that terrible. Be sure to check out the unboxing video on my Facebook page that Adam and I did. We shared our first impressions of our boxes and contemplated on what we’d keep. Ehhhh the style was fine. I have one (Albeit a little thinner) from Old Navy that does the trick as a top layer in cold weather that was about a third of the price. In my box it was black, but I could have traded for burgundy, navy or grey if I had wanted. I just didn’t love the flashy design under the arms. The fit was good on these and they felt really good. But the neon… I wasn’t feeling the neon. They did have a black and white version but were out of my size. Wamp wamp wamp. The price was certainly right with this one, but as you can see it was a bit sheer (yes, I could have exchanged the color) but it just… felt thin. 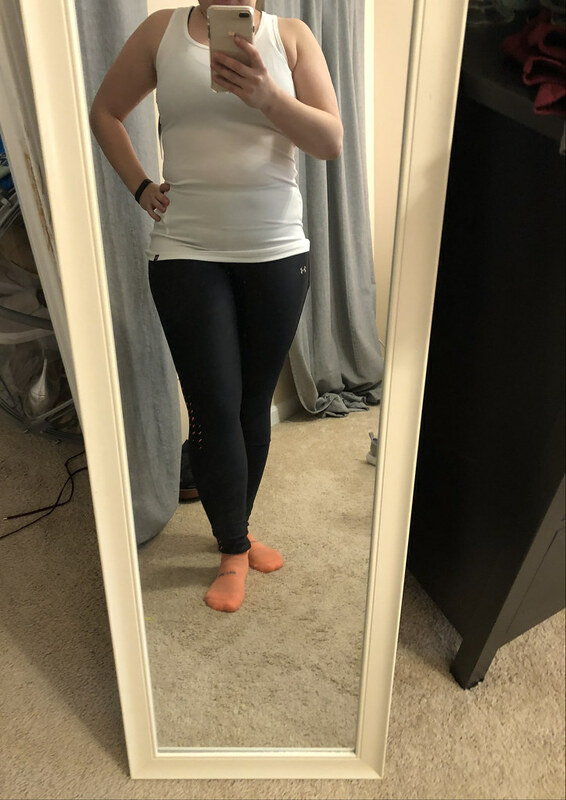 I don’t really like my tanks fitted, in fact I’ve gotten rid of most of the tanks that I had that were fitted – I have a few for when I bike in the summertime, but generally I wear looser tanks like these from Old Navy which are my current favorites or these from Under Armour. It fit just right. But super high impact bras terrify me. The front zip was fine, but I dunno. I’m super fickle about jog bras. This just wasn’t right for me. I wanted to love these sneakers but I like a bit more cushioning. They had a low heel-toe drop, which I don’t mind but they felt narrow for a running shoe, and $120 is a bit out of my budge at the moment. The tongue on the sneaker was a little odd and the shoe just felt like it didn’t have the type of stretch that I generally like in my sneakers. If I needed socks, I would have grabbed these. Buuutt I don’t. That being said, I DEFINITELY recommend UA socks if you’re in the market for a solid athletic sock. $20 for a six-pack of high quality running/workout socks is not a bad deal. Once you send it back (you have a week to try everything out), you have the opportunity to give your stylist feedback on what you loved and didn’t. I mentioned I wanted to see more variety – running isn’t the only sport i do and I really love pieces that are multi-functional, less fitted. I don’t need sneakers or socks, so really, i would have loved a pair of gym/studio leggings/top and a running top/bottom set. But, thats feedback i gave. Want to try it out? Check out the details and sign up here!